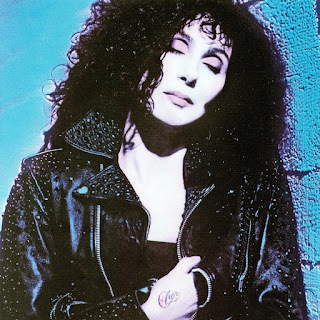 In 1987-1988, after firmly establishing herself as one of filmdom's most sought-after actresses, the multifaceted Cher staged a highly successful musical comeback with her rock & roll-leaning album Cher. The album scored a Top Ten hit with her version of the Michael Bolton power ballad "I Found Someone" (previously a minor hit for Laura Branigan), a Top 20 hit with the biting, Bon Jovi-penned "We All Sleep Alone," and a club hit with the almost forgotten Madonna-ish dance ditty "Skin Deep" (a radical departure from the album's other songs, yet a definite highlight). The album also includes a rock remake of her 1966 smash, "Bang Bang." Other highlights include her collaboration with Darlene Love and Bonnie Tyler titled "Perfection," the rockin' "Dangerous Times," "Give Our Love a Fighting Chance," and the wonderfully sweet ballad "Main Man" (for which a video was also filmed). Despite this impressive comeback album, 1989's Heart of Stone was an even bigger success. In an era of hair bands, leather accessories, and arena-sized ballads, faux metal babe Cher once again reaffirmed her never-ending and eternally surprising popularity.